ABC Radio and Skyview Networks partner to syndicate "The Deja Vu Show," featuring the afternoon host on WBLS-FM/New York. In the new 4-hour weekday show for Urban AC music formats, Deja Vu will provide female listeners a mixture of entertainment, lifestyle and positive affirmation. The syndicated show brings the best of Deja Vu, PPM friendly benchmarks and personality. She's also a speaker, author, philanthropist and lifestyle expert. "Every day I look to provide listeners an escape at work. Radio allows me to connect with, inspire and motivate listeners in an amazing way," siad Deja. "Deja brings a contagious energy to the midday format," says Steve Jones, Vice President and General Manager, ABC Radio. "Deja is a proven ratings winner who will have immediate and measurable impact for her new affiliates." 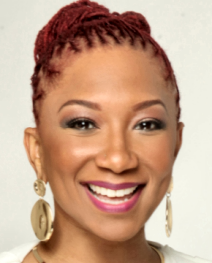 "Deja's a force for us both on and off air," added WBLS/New York Skip Dillard PD. "From her daily show, to social media and video, she continues to develop creative ways every afternoon to reach and engage her listeners. I'm so excited Deja's talents can now be experienced in every radio market in America." The launch of The Deja Vu Show represents the latest collaboration between ABC Radio and Skyview Networks since announcing their joint syndication and sales initiative in April. Last month, the two companies announced the launch of "The Dana Cortez Show."